Surgitube Tubular Gauze Bandage provides a seamless, secure dressing for hard-to-dress areas. 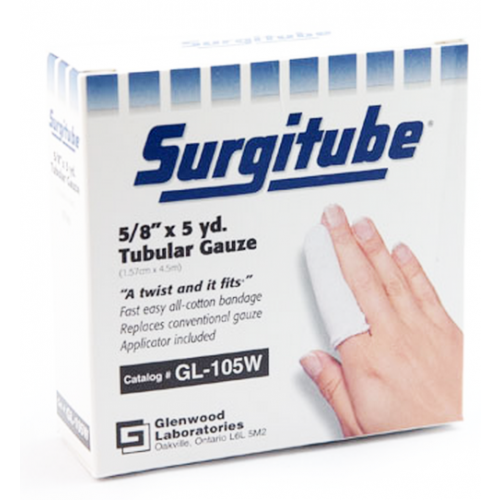 Surgitube Tubular Gauze is made of cotton and is hypoallergenic. Most of the tubular gauze bandages come with a dispenser box or applicator. 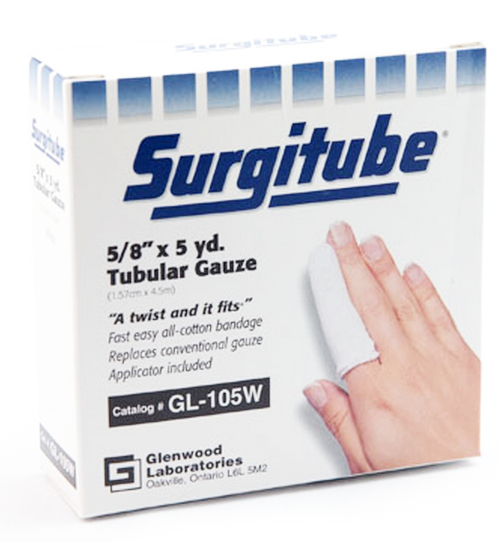 Surgitube tubular gauze bandages come without an applicator are indicated by "without Applicator" in the "Size or Variation" column above. Weave Options: 1 ½Inch Tubular Gauze available with tight weave option. Excellent tool for fishing with chicken livers. Sorry about not using the product for dressing wounds, but its an excellent pouch for holding chicken livers on a hook when fishing for catfish. It worked so well i had to order more before i ran out of my first order. The material is not tight enough to stay in place without a tape at the end of the fingers or using the tying method. Pray the material can be more elastic so that once stretched outside the applicator, it returns to the original circumference and have a tight fit on the fingers. Very easy to use. Very happy with service tracking of order is a plus. Product is easy to use husband uses every day on chronic. big toe ulcers. Will be ordering more in future. The idea is great, but the product material has no body and just went limp as we tried to use it to hold vasoline dressings on the calves of legs. Medi-tech product much better. I got an injury while performing at state level cheer-leading competition. I sprained my left foot and the doctor told me I had to be bandaged for more than 1 month because the sprain was really bad. this gauze became my company for a month. It was easy to use and really helped me compress my ankle. I healed pretty fast because of this! The Surgitube Tubular Gauze is used to protect primary dressings and ensures a secure dressing. It is made of cotton and hence is hypoallergenic. It is used for dressing hard to dress areas. It is easy to use and is very effective. It saves us from the trouble of using adhesives to secure dressings. It is a pretty useful product.